In 1996/97, the National Rail Corporation carried 16 billion net tonne kilometres of freight and paid $117 million in track access fees – if the same amount of freight was carried by road it would require 3,100 B-double trucks that would pay only $17 million in registration fees. According to the Australasian Railway Association Inc., track access fees applying to rail operators increase rail's taxes and charges to over 40% of operating costs, two and a half to three times that of road. Articulated trucks comprise 12% of vehicle kilometres on the National Highway System (NHS), but cause two thirds of the road damage to that system. Cars comprise 81% of vehicle kilometres on the NHS, but cause only 0.1% of its damage. Cars are subsidising and giving the road transport industry a huge advantage over rail transport. Rail transport is seven times safer than road transport, 0.55 fatalities per billion tonne kilometres to 3.8 for road transport. The National Road Transport Commission suggests that fatigue was a factor in 70% of truck accidents. Of the total cost of transport accidents in <?xml:namespace prefix = st1 ns = "urn:schemas-microsoft-com:office:smarttags" />Australia of $6.5 billion, road transport accounts for $6 billion (92%). Rail accidents are estimated to be just over 1% of that total. Australia's reliance on road transport is killing and injuring us at an alarming rate. Road transport consumes almost 90% of Australia's transport energy with rail transport just 3% and only 2% of the nation's transport domestic greenhouse gas emissions with road transport a massive 86%. Transport now comprises 17% of Australia's greenhouse gas emissions – an increase of 15% over its 1990 level. One freight train operating over the nearly 1,000 kilometres between Melbourne and Sydney can replace 150 semi-trailers and save 45,000 litres of fuel and 130 tonnes of greenhouse gases compared with road haulage. Consider the implications. There are about 3,200 trucks per day between Melbourne and Sydney. That's one truck past any given point every 25 seconds. Yet, just ten additional trains each day each way between these two cities would remove all those trucks off the highway saving 330 million litres of fuel and 1 million tonnes of greenhouse gases per year. Instead of addressing these problems, it is forecast that fuel consumption by articulated vehicles will increase by 70% over the next fifteen years with greenhouse gas emissions 75% over the same period. That makes a mockery of Australia's commitment to lowering greenhouse gas emissions to be no more that 8% above its 1990 levels by 2012. Between 1975 and 1988, the Federal Government invested $34.5 billion on roads and $1.8 billion on rail. As a result, Australia's rail industry has to deliver 21st century service on 19th century infrastructure. The National Transport Planning Taskforce (NTPT) rated Australia's interstate rail corridors as generally well below world's best practice. Interstate rail corridors east of Adelaide were identified as having excessive curves and grades and restricted clearances. 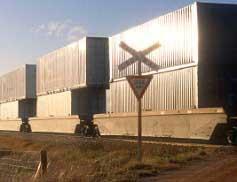 These significantly impede efficient rail operations by restricting train speeds, restricting trailing loads, preventing adoption of technological improvements such as double stacked containers (one container on top of the other) and causing higher fuel consumption and equipment maintenance than if track improvements were made. Why do some consumers prefer road transport for general freight? It is cheaper and faster. The cost advantage is caused partly by extra taxes and costs heaped on rail transport and partly by cost conscious road transport operators who are able to force contract drivers to work prohibitive hours. The speed of delivery is hampered in rail transport by slow loading techniques and slow trains. With improved track conditions, modern fast trains could compete with road transport. How do governments in the 21st century correct the mistakes of earlier governments? They can't raise costs to road transport operators after decades of minimising their costs. We can imagine thousands of semi-trailers descending on Canberra if the government tried to do that. Not to mention the thousands of truck drivers who would be made bankrupt and out of work. Chaos would be caused to the truck sales industry with thousands of unsaleable trucks sending many businesses to the wall. The profile of rail transport must be raised in this country and upgraded to be a significant partner with road, sea, and air transport. Australia needs all systems of transport to compete on an equal playing field. This means lowering the cost and correcting the low investment in infrastructure for rail transport in the future. The move to privatise the railways must be accelerated. The contest between the railways and road transport is a classic example of the difference between public and private enterprise with very predictable results. In short, the railways need entrepreneurs to revive and revitalise the industry. Where are the Sir Peter Abeles or the Sir Reginald Ansetts of the railways? They surely are needed. Australia must be able to enjoy the benefits of a robust and efficient rail system. Our future depends on it. Perhaps the penny has dropped with the opening of the new Adelaide to Darwin rail link. More privately owned railways are finally promoting themselves. But there is a long way to go. If only those Governments in the past had to for sight to see how their bad decisions would take decades or maybe centuries to fix. Sources: Austroads Website - Monash University research on truck accidents - Australasian Railway association Inc.Website.